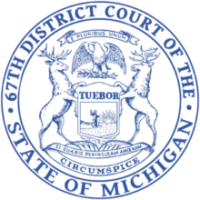 The 67th District Court of Genesee County is a limited jurisdiction court, authorized under state statute, with jurisdiction over Genesee County, including the City of Flint effective January 2, 2016. The Court has ten elected judges, four appointed magistrates, nine probation officers and a staff of fifty employees. The Court is responsible for parking citations, traffic violations, criminal misdemeanors, preliminary examinations in felony cases, landlord-tenant, small claims, and general civil cases.